Many of NOAA's water level stations are equipped with meteorological and additional oceanographic sensors to collect observations such as wind speed and direction, air temperature, water temperature, water conductivity, barometric pressure, relative humidity, and visibility. Meteorological conditions can greatly impact water levels. For example, onshore winds tend to elevate water levels and offshore winds tend to suppress water levels. There are many other factors that affect water levels in various water bodies but changing meteorological conditions such as frontal passages and tropical storms can dramatically change water levels in a very short period of time. In addition, the combination of water temperature and conductivity provides a measurement of the water's salinity, which affects everything from a ship's draft to ecological resources. Click on the links below to find stations that have these observations available. Water Temperature and Conductivity - A listing of stations that provide Water Temperature and/or Conductivity. 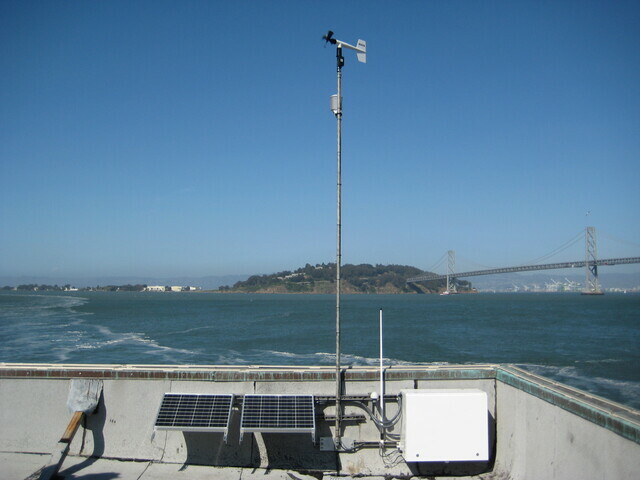 This meteorological station in San Francisco, CA provides wind, air, temperature, barometric pressure, and relative humidity.